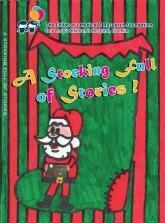 Blog A STOCKING FULL OF STORIES! A STOCKING FULL OF STORIES! I am delighted to let you know that A Stocking Full of Stories has gone to print and is available to buy through my website! Just go to the products page. I am looking forward to wrapping up books and posting them (hopefully) all over the world. As everyone has worked for free (writing the stories, editing them and designing the book) we are able to donate €5 from the sale of each copy to Crumlin Children’s Hospital! I will keep you posted on how sales are going. So far I have processed almost three hundred preorders!